Cross Country Canada hired Erik Bråten as the new national team coach on November 1st, joining Louis Bouchard. After a short delay to get a work permit, Bråten arrived in Canada on November 15th. Graduate of the Norwegian School of Sports Science. Winner of the coach of the year from the Norwegian ski federation. Previously Head Coach at Team Kollen, the junior team constituted from clubs based at Holmenkollen in Oslo. Nic Lemyre, High Performance Consultant to CCC, described the initial division of national team roles this way. There will also be an east/west division of athlete responsibilities, with Bouchard based in Quebec City and Bråten based in Canmore. While some may be concerned that doesn’t speak French yet, Lemyre doesn’t see that as a problem. Given that Bouchard and Lemyre both have French as a first language, communication with athletes shouldn’t be an issue. FasterSkier conducted an initial interview with Bråten over the phone while he was in Oslo on November 1st. 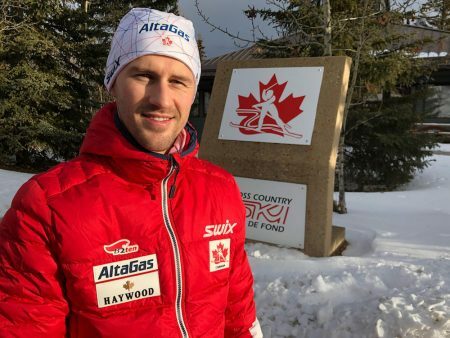 The second set of questions were answered by email, when Bråten had begun settling in Canmore on November 21st. How much time have you spent in Canada? None. Never been there. It will be a first for me. A tourist in the U.S., that’s the closest. So it will be a totally new experience for me, and a long move. Well, I really love to build up a system. The opportunity to go in and help out actually building that system, that is already there, but at least Nic has talked about a few changes that he wants to make. Good ideas to develop further, which is based on how the coaches, the national coaches communicate with every athlete on the team, how we communicate with the club coaches, and how we can maybe have some gatherings or some knowledge development for the coaches, and maybe make a little clearer what the Canadian philosophy is. What will you contribute this season? I’m coming in at a special time of the season. It’s like races in a few weeks, and I’m coming in as a new coach. Of course, even if I had issues with anything, I can’t come in and change it. It’s another opportunity to come and contribute right away, but at the same time, just use some of the season to see what’s going on, see the training diaries, talk to the leaders, and really know the whole picture of what is the Canadian model. I’m not coming over there and having to make a season plan in a week. I have some time to get to know information, because training is almost done. I think it’s a great opportunity to learn, to observe, and put some small things in my philosophy. We [will] start planning for next season, which starts quite soon, but the details of course come after Christmas. I hopefully have something to contribute. How did you come to win the coaching award? There were both coaches and athletes that nominated me separately, and the club has been doing really well for the last, well for a long time. But especially the last two or three years has been really, really good. They put a lot of weight on the Norwegian cup for juniors, because we have dominated quite extreme there for the last couple of years. That several athletes and some coaches also separately nominated me was put into consideration, because that wasn’t that usual. Did you know Nic Lemyre in Oslo? Well, not really. He is working at the Norwegian school of sport science and I took my education there, and had a little lab assistant role after I was done my education. Even though we have been at the same school for a long time, he as a worker and me as a student, we haven’t really known each other. We know the same people, so he had a lot of references on me that I didn’t know. My French is terrible, it’s nothing. I have German in school, and Norwegian and English of course, not that my German is anything either. I really don’t know any French. Nic told me I should buckle up and learn, try to learn, some basics. Who have you met during your first week in Canada? Over the last week I have met most people in the Canmore office, a few local athletes who are not, the National Team and some club coaches. Louis and I have established regular contact on mail and phone, the same goes for Joel Jaques [CCC’s Technical Services Coordinator] so we have a good system in place built on trust and professionalism. I met all of the female athletes in person except Cendrine [Browne], and I have met a couple of the guys. With Lillehammer next week and then Sovereign Lake and Whistler coming up I am happy to say I [will] have met most people in the system before Christmas. Why did you choose to coach instead of race? I was better at it and I have always liked to help others reach their potential. But I am glad I did competitive skiing as long as I did, I think I learned a lot I can use as a coach from that experience. I think I am good at seeing the whole picture. It allows me to understand if the training is right, is the motivation right, are all social factors in place etc. And all these factors are important to be in place for an athlete to have the desired progression. I also think I am good at seeing my own limitations, and getting help from experts when I don’t have the knowledge in a particular area. How will you measure your success in Canada? I am coming in very late this season, so for the first few months the most important task for me is to get to know everybody and learn the system. But over time it’s kind of simple, better Canadian results in the World Cup, championships and most importantly Olympics. What was your first culture shock moment in Canada? I have not really had any big culture shock so far. It really is not that different from Norway. But the average person is much nicer here, at least the first time I meet them. Everyone thinks it’s cool I am here, and are excited to work with me so that is a big motivational boost for me. Name one person who has helped you to be a better coach? And how? A lot of people have been important to me of course, but I want to specifically mention two people. The first is my mentor from my time on the Norwegian School of Sports Sciences, Thomas Losnegard. He is a professor there, and I have spent endless hours in the lab with him. He has a unique way of being so knowledgeable on all theory, but at the same time being able to translate it in to practical use for coaches and athletes. The second person is Kristian Bjune Sveen who is Head Coach for the China National CC Skiing Xinjiang Team. We coached Kjelsås together for four years and learned a lot from each other. What was your favourite moment on snow? 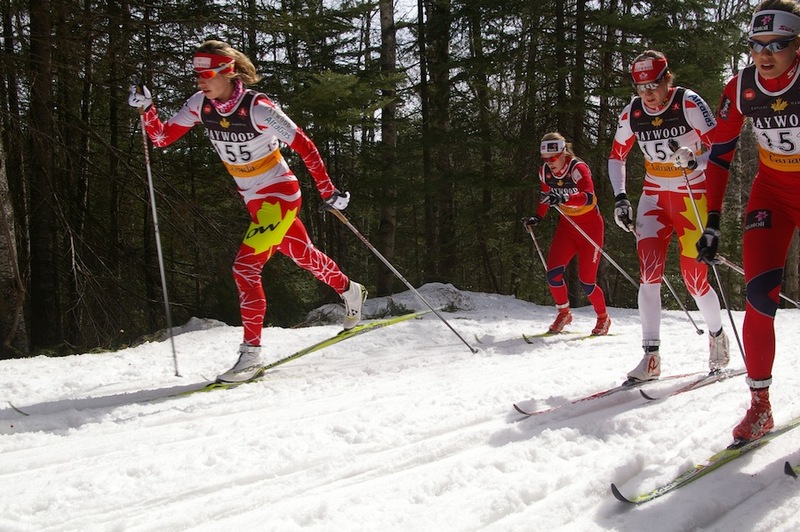 Haga visited Canada long before Bråten did, seen here in 2012: Chandra Crawford (l) leads with Norwegian Britt Ingunn Nydal (far right) on the fourth of six loops in the 30 k classic mass start at Canadian Ski Nationals on Saturday. 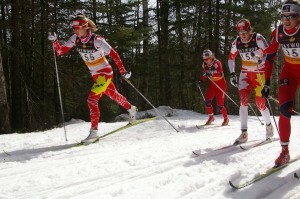 Dasha Gaiazova (second from right) and Norway’s Ragnhild Haga (second from left) stay close behind. The first would be as a coach. 14.jan.2017 in the Norwegian Cup for juniors for the K17, it was a sprint race. I had two athletes in the final, and they finished one and two. Right after they crossed the finish line the rest of the girls from the club stormed the finish area and celebrated together. That moment was special. The second one would be when my good friend Ragnhild Haga won the 10k in the Olympics last season. What does an athlete need mentally to succeed? Personalities vary widely, but what can you say about what is needed? As you point out, personalities vary, but I think wanting to do the work that is necessary and just having fun is important. Being critical of your own training, and always wanting to do things even better, and not just copying yourself from season-to-season. And, you have to like the lifestyle. It is a lot of training, and when you are not training, you need to rest a lot, and there is a lot of traveling. What are the different training groups you worked with? Kjelsås is the club I coached, Team Kollen is the regional team for juniors in Oslo. Team Obos is the regional team for the seniors in Oslo. How do you form a team from multiple clubs in Norway? How well do the clubs work together? Clubs in Norway have widely different opinions on how to do things. But I think what is important is to find common ground, and find the things we agree that we can do better together then apart. And if we can agree on what that is, we can meet up and do that together, and do different training separately. One of the repeated ideas from HP in Canada is that different athletes need different environments to succeed. Do they need different training philosophies as well? A training philosophy should include that we are different and need different things. The demands you need to ski fast is the same for everyone, but which demands you are good at varies greatly. A lot of training should be done by everyone, but how much focus on different task for each individual is the big question that is different from athlete to athlete. As a coach, I therefore think that you need find what everyone should do, and put that in to camps and trainings we set up together, and then find out what each individual athlete should focus extra on in the training on their own. When it comes to environments, I think athletes need to be good at finding the right balance for them in terms of who they spend time with when they are not with their team. And teams should use time to figure out together how they want the culture in the team to be.